Welcome to the 3rd April edition of our weekly ebulletin that contains lots of updates, news and views. Do email us if you have any news or information that you would like included in a future bulletin. Donations to NSUN are gratefully received for this free service. You can donate directly here. NSUN, in partnership with Inclusion London, is organising a meeting to put together ideas for letters to the government and Professor Sir Simon Wessely and for a press release which advocate a human rights approach to current plans to reform the Mental Health Act. If you’re able to come to the meeting, please email Dorothy Gould. Independent Review of the Mental Health Act , the service user and carer survey has been extended untill 6 April. In 2017 the United Nations Committee on the Rights of Persons with Disabilities recommended that UK Governments should:‘Repeal legislation and practices that authorise non-consensual involuntary, compulsory treatment and detention of persons with disabilities on the basis of actual or perceived impairment’. Over 20,000 people were battling problem debt whilst in hospital for their mental health last year in England alone – with thousands more struggling at home. The Government is introducing a new ‘Breathing Space’ scheme, to give people in problem debt a window without fees or charges, and where they won’t be pursued by creditors if they seek debt advice. But this won’t support the tens of thousands of people in mental health crisis who are too unwell to either manage their finances alone, or to seek debt advice. A campaign by Money and Mental Health is calling on the Government to extend the Breathing Space scheme to allow people in mental health crisis space to recover. We’re supporting them and back their call for #RecoverySpace. Find out more and add your name here. Places must be booked as no admittance on the day if your name isn't on the attendance list. 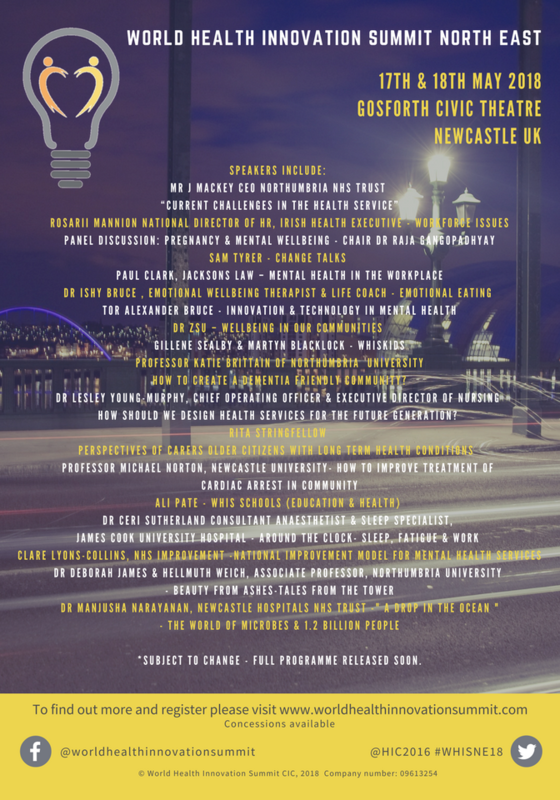 The World Health Innovation is a two day festival of health talks will put the North East at the centre of a worldwide movement for health and social care. The focus is on promoting innovative solutions on wellness, preventing illness, and leadership. Speakers include Northumbria CEO, Mr Jim Mackey and the Irish Health Services National HR Director Rosarii Mannion. The packed programme which includes both nationally renowned and local speakers will be focused on finding new ways to support existing services. They will be sharing their insight into the future of healthcare. Social media followers of the World Health Innovation Summit are already joining conversations on Twitter @WHIS_Newcastle #WHISNE18 and on Facebook. 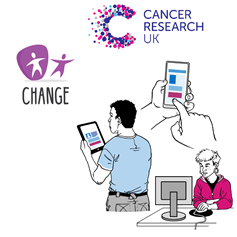 CHANGE is working with Cancer Research UK. Together, we want to make their online information better. Cancer Research UK would like to find out what information from their website will be most useful to users with accessibility needs and lower literacy levels, and what is the best way to access this information. 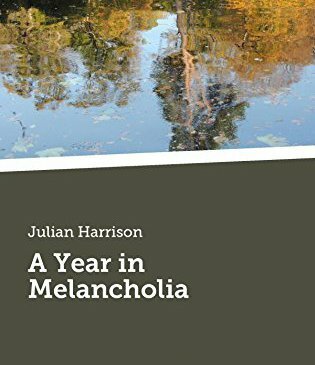 ‘A Year in Melancholia’ is my journey through one year of living with depression and OCD. Of coping (and occasionally not) with mental illness. As a narrative, it is often savage and brutal, sometimes heartrending and passionate, occasionally light and humorous, but always honest and authentic. Beginning on 1st January and ending on 31st December 2016, ‘A Year in Melancholia’ is a no holds barred account of what I have to deal with and how – and crucially, whether – I do so. The book can be purchased on Amazon or United PC, the publisher . CQC are holding a coproduction event on Sexual safety in Mental Health settings. They are looking to involve public representatives in coproducing a report on the reporting of sexual abuse and/or harassment in Mental Health Inpatient settings. Please complete this survey to register your interest, providing as much detail as possible regarding the groups you work with and the engagement you undertake with them. The report, Are we listening? A review of children and young people’s mental health services, published 8 March, has found that too many children and young people find themselves at ‘crisis point’ before accessing mental health services because health care, education and other public services are not working together as effectively as they could to protect and support their best interests. The thematic review of children and adolescent mental health services was announced by the Prime Minister in January 2017. The initial phase of this work was published in October 2017. CQC's annual report, Monitoring the Mental Health Act in 2016/17 was published 27 February. The report on the use of the Mental Health Act (MHA), looks at how providers are caring for patients, and whether patient’s rights are being protected. Too many people could be being placed in residential mental health rehabilitation services that are far away from where they live, for too long and that are costly for the NHS. The report published 1 March, found through an information request to providers that nearly two thirds (63%) of placements in residential-based mental health rehabilitation services are ‘out of area’, which means they are in different areas to the clinical commissioning groups (CCGs) that arranged them. The state of care in mental health services 2014 to 2017 report presents findings from our programme of comprehensive inspections of specialist mental health services. Part of the Independent Review of the Mental Health Act , the service user and carer survey has been extended untill 6 April. The TPC seeking the views on the proposal to amend the Tribunal Procedure (First-Tier Tribunal) (Health, Education and Social Care Chamber) Rules 2008 in relation to mental health cases under the Mental Health Act 1983 has been published. The consultation will close on the 14 June 2018. New guidance from NHS England sets out a pathway for Improving Access to Psychological Therapies (IAPT) for people with long term conditions and medically unexplained symptoms.